The chick is now two weeks old and as you can see has grown very quickly indeed. It is clearly getting plenty of food from its parents. It is also much more mobile and can waddle around the tray quite happily. Here is is looking for some shade behind Bella. Bella still does the majority of the brooding, and here is seen getting the chick to move closer, although the chick doesn't seem to think it needed to! This is the view from camera 3 - there is no sound. At 9 days old, the chick is becoming more and more demanding! As soon as food arrives, it begs to be fed. It has even tried pecking at the food itself. The weather has been rather hot and Bella has (at times) been a really good parent and shields the chick from the sun. At other times, she leaves it completely alone, and it just lies there in the full sun and pants to try to keep cool. Bella is doing virtually all the feeding and incubation using food caught by CR. Sometimes he briefly appears to deliver food to the tray, and at other times, Bella seems to collect it from the "larder" higher up the tower. Bella is quite houseproud, and flies off with any prey remains after feeding the chick. She also removes some of the sticks that have fallen from the pigeon nest immediately above. The surviving chick is now 5 days old and is feeding well and as a result is growing fast. 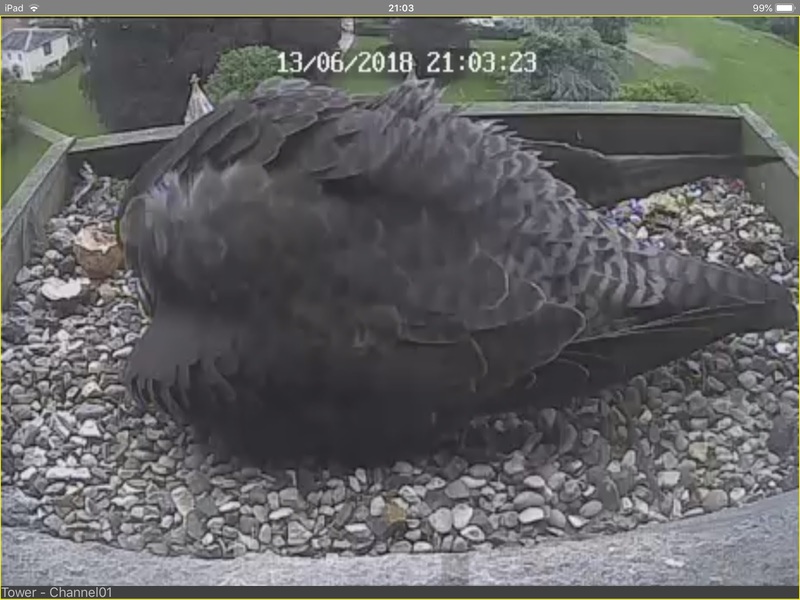 The parents are clearly finding plenty of food, and they are even storing surplus in a "larder" on the top of the tower. Sadly the last egg is overdue, and is now unlikely to hatch. The third and final chick should have arrived by now. Sadly it hasn't hatched, so it is rather unlikely that it ever will. The surviving chick seems to be doing OK, and is certainly taking food and growing rapidly. Now standing in the churchyard between the Abbey and the Gander Lane car park, connect to the WiFi network called “Falcons”. The password is “peregrine”. As luck would have it, CR was also incubating when the second chick hatched at 9.45am on Friday 15th June. This time, he made some very strange quacking type noises, and shortly after a piece of eggshell was seen beside him indicating the arrival of chick #2. Bella turned up some 4 hours later with some prey and immediately started to feed the new arrival who tried to take it, although mostly without any success at this stage. This will take a bit more practice. In case you were wondering why there are so many sticks appearing on the tray, there is, believe it or not, a pigeon nest a couple of feet above them! Here is the moment about 2 minutes after the first chick hatched when CR (who happened to be on incubation duty at the time) handed over to Bella. She must have heard it squeaking as she seems very interested in what CR was sitting on. She even gives it a gentle nudge before brooding it. Sadly, this chick died the following day, possibly from starvation as for some reason, it didn't look like it was ever given anything to eat. Let's hope that chicks #2 and #3 are OK. They are due to hatch any time now. Sadly, the first chick to hatch has died. It looks like it wasn't getting any food and succumbed to starvation. Apparently this is sometimes the case with first-time parents. The other two eggs are due to hatch imminently, so let's hope that these two are OK. It looks like at least one egg has hatched. Look at the left side of the picture next to Bella's head. This picture was taken using an iPad connected to the WiFi link during a brief visit tonight. I will check the video recorder in the tower tomorrow evening to see what else the video camera has captured. Usually Bella does the night time incubating stints, so it was unusual to see CR handing over to her just after midnight. It took him a while to fly off into the darkness. 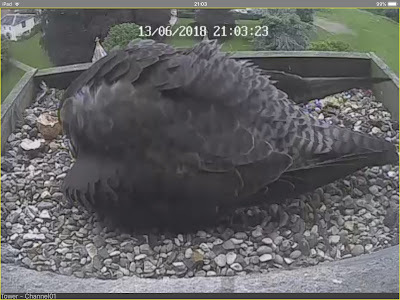 As the level of activity is about to rapidly increase with the imminent hatching of the 3 eggs, I thought it would be a good idea if the live video from the camera was made available. There is no internet connection in the tower, but I have rigged up a WiFi link which seems to work outside on the Abbey Lawns, but I have not been able to test it with more than one device at a time. Now standing in the churchyard between the Abbey and the Gander Lane car park (eg by the copper beech tree), connect to the WiFi network called “Falcons”. The Password is “peregrine”. The range of a WiFi signal is fairly short, but it seems to work OK on the Abbey Lawns. Also note that the gates are locked each evening.